If you’re just starting out or expanding your Bing Ads account, a helpful feature is the ability to import campaigns from Adwords. When you think about how complex and extensive the data is stored in PPC platforms, this is actually a very short list. Let’s take a look at each one to better understand the implications. Negative Keyword match types will differ depending on goals and campaigns details. Its important to note that Bing Ads negative match type default is phrase match with exact match as another option. When you import your negative keyword list to Bing Ads, any broad match types would automatically be converted to the default phrase match. Because the keywords are converted to phrase match and potentially more specific, you may want to review the list and add any additional negative keywords that may cover variations or a different word order. Bing Ads and AdWords have shared lists that can be created to apply a group of negative keywords to several campaigns. If you manage negative keywords primarily through lists in AdWords, your negative keywords will not be imported into Bing. Bing Ads offers a shared library feature, so its quite easy to simply “create new negative keyword list” in the shared library and paste in your keywords. Don’t forget to add your campaigns to the list so the negatives can be applied to it! Ad extensions are one of the greatest features of Bing Ads. These provide “bonus” information in the form of text and sitelinks, phone numbers, and even images. A savvy PPC manager can max out these extensions and gain better CTRs for campaigns. 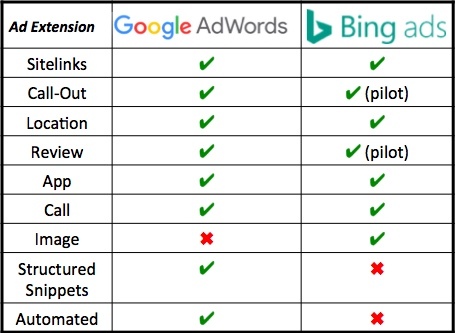 The following chart details the availability of ad extensions in each platform. Once the new campaigns and ad extensions are imported, check them to ensure they have imported correctly and are assigned to the correct campaigns. This is only a few tips for the campaign import process. Once the campaigns are set-up, the optimization for Bing Ads should be begin to maximize overall performance. 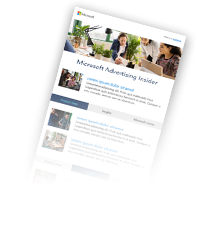 I created a guide that outlines helpful tips for importing and optimizing Bing Ads and posted it on my website, Big Click Co. Feel free to download it for a deeper dive into this topic. * Note: Bing Ads does not import sitelink and app extensions at the ad group level, only at the campaign level. Lisa Raehsler is a search engine marketing and pay-per-click (PPC) strategist, nationally-recognized speaker, and columnist for industry leading publications. As the founder and principal strategist at Big Click Co., Lisa works with companies and agencies of all sizes to integrate PPC advertising into online media strategies for brand promotion, demand generation, and customer acquisition. Lisa has led strategy and management on hundreds of paid advertising accounts for search engines (Google AdWords and Bing Ads), mobile, display, retargeting, and social media ad campaigns. Her experience spans seventeen years and includes working with national brands at agencies and at the enterprise level at Thomson Reuters. Lisa has spoken about PPC, mobile, retargeting and many other online marketing topics in podcasts and webinars. She has also spoken at numerous leading industry conferences, including Pubcon, ClickZ Live, SES, OMS, MIMA, HeroConf, and SMX, as well as training events. Lisa also shares her expertise on digital marketing and paid search advertising as a columnist for ClickZ and Search Engine Watch. Follow her on Twitter @LisaRocksSEM.